Offering healthier items on children’s menus will be a priority this year for restaurants nationwide, according to the National Restaurant Association, which begs the question, why now? Why are restaurants suddenly waking up to the nutritional needs of kids? The answer, quite simply, is that enough parents are finally demanding it, suggests syndicated family travel columnist and TakingtheKids.com creator, Eileen Ogintz. Beyond restaurants making their kids menus healthier, hotels and theme parks are getting in on the action, too, Ogintz says, noting that Hyatt has partnered with renowned chef Alice Waters to craft an organic kids menu. 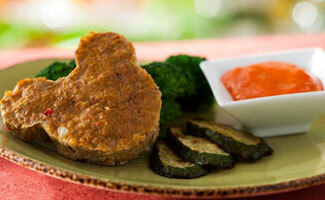 And these days at Walt Disney World, you might find turkey meatloaf – shaped like Mickey Mouse ears to boost its appeal. As food providers in the travel world strive to do the right thing, what else should family travelers keep in mind if they want to eat better on the road? Ogintz offers several ideas in this brief Q&A. Shermans Travel (ST): What temptations at restaurants and hotels work against families trying to eat healthier? Eileen Ogintz (EO): Any restaurant that offers to "super size" soft drinks for a few cents or serves giant sides of fries, and kids menus that offer a choice of fried chicken fingers, mac and cheese, and burgers. It isn't that we shouldn't be able to indulge on vacation, it's just that we shouldn't at every meal. But the only way this will change is if parents call the restaurants out and let the manager know they want more healthful choices! ST: As a traveling parent, what are some things you've historically done to keep your family eating well on the road? EO: I think it's always good to stay somewhere with a kitchen so that you can cook some of your own food. It will be cheaper and more convenient, as well as healthier. It's always good to pack your own snacks – fruit, granola bars, carrot sticks, etc. – so you aren't as tempted by sweet treats. And that goes with packing picnic lunches or dinners if you can. Often restaurant portions are huge, so suggest the kids split an adult portion (or split one with them) instead of ordering from the kids' menu. Ask if you can order a half-price portion for the kids – you can also order an appetizer-sized portion. And always bring reusable water bottles. Not only are you traveling greener, but you won't be as tempted to buy soda or other sugary drinks. And the bottles become souvenirs when the kids put stickers on them. ST: What bit of lifestyle advice might you give to a family who wants to eat healthier on vacation and once they return home? EO: Control portion size! Portions are way too big in restaurants and often we eat everything – and encourage the kids to – because we have paid for it. Either order half portions, or if you have a fridge where you are staying, take home the leftovers. Also go visit a farmer's market where you are. Talk to the local farmers and see what fruits and veggies they have that you don't see at home. It will really encourage everyone in the family to eat local and understand where their food comes from!